Hotep (ḥtp) is an Egyptian word that roughly translates as "to be at peace". The word also refers to an "offering" ritually presented to a deity or a dead person, an "offering table," an individual being "at rest" in a literal sense (sitting on a throne) or a figurative sense (being dead), the action of the sun when it "sets" in the west, and other, less common meanings. 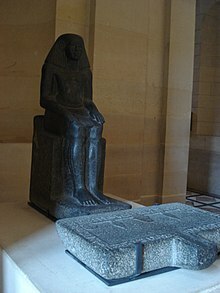 Hotep is regularly found in the names of ancient Egyptian figures such as Hotepsekhemwy (ḥr ḥtp-sḫm.wj "the two powers are at peace"), the first ruler of Egypt's Second Dynasty. Recently, hotep has been defined as the result of action in accord with maat. Hotep and hetep are the Egyptological pronunciations of Egyptian ḥtp, which was pronounced differently over time. Cuneiform texts during the New Kingdom period suggest the contemporary pronunciation of /hátap/ for the verb, which eventually became Coptic ϩⲁⲧⲡ/ϩⲟⲧⲡ hatp/hotp "be content" and ϩⲱⲧⲡ hōtp "be reconciled". Hotep is rendered in hieroglyphs as an altar/offering table (Gardiner sign R4). It has special semantic meanings in the Ancient Egyptian offering formula, also known as the ḥtp-dj-nsw formula, to refer to the "boon given by the king", or the food and goods on which a dead soul was supposed to subsist during the afterlife. The phrase m ḥtp has been translated to mean literally "at peace" or living the life in balance (Maat). Since the mid-2000s, a Black nationalist new religious movement has emerged that calls itself Hotep. Followers of the Hotep movement are African-American and follow an Afrocentric version of Kemetism with the claim that the ancient Egyptian pharaohs were black. The title of the American comedy film Bubba Ho-Tep (2002) refers to the nickname for a reanimated mummy that wears a cowboy hat. Hotep is an avatar available in Active Worlds. "Hotep" is a commonly used greeting in Afrocentric circles. Hotep is one of the advisors to Pharaoh in the animated epic film The Prince of Egypt (1998). Nyarlathotep is a deity or a demon in stories by H.P. Lovecraft. In S01:E08 - Apple of ABC’s The Good Doctor, character Claire Browne (played by Antonia Thomas) refers to Hotep as the mother of modern medicine. In S02:E05- Dear White People, Joelle dates a student, whom she discovers is a "Hotep,” which causes her to end this relationship. ^ "Egyptian kings - Hotepsekhemwy, Hetepsekhemwy, Bedjau, Boethos". nemo.nu. ^ Davies, Vanessa (2018-09-11). Peace in Ancient Egypt. Harvard Egyptological Series. Brill. p. 2. ISBN 978-90-04-38021-9. ^ Gardiner, Alan. (1957). Egyptian Grammar, Third Edition, p. 170. Griffith Institute, Ashmolean Museum, Oxford. ISBN 0-900416-35-1. ^ "NiankhkhnumKhnumhotep Names United". egyptology.com. ^ Branney, Sean (1988). Strange Eons (PDF). 2, Issue 10. Retrieved July 16, 2006. ^ Rudy Aunk (November 29, 2007). "What is the Meaning of Hotep?". The Cultural Health News Blog. Retrieved 2014-07-31. ^ Angelica Jade Bastién (October 16, 2016). "'Insecure' Season 1, Episode 2: Failure to Change". The New York Times. Retrieved 2016-11-01. Davies, Vanessa (2018). Peace in Ancient Egypt. Harvard Egyptological Series. Brill. ISBN 978-90-04-38021-9.
p 179 htp = "altar, offering, boon which the king grants, be pleased, be happy, be gracious, pardon, be at peace, be peaceful, become calm"
p 180 "rest, satisfy, make content, htpw peace, contentment, good pleasure, make peace, htpt peace, contentment. To put to rest disputes, and settle the complaints of petitioners be peaceful, calm, make peace". Wikimedia Commons has media related to Hotep (hieroglyphs). This page was last edited on 9 March 2019, at 12:04 (UTC).